Legend of the Five Rings: The Card Game is known for its intense, strategic, head-to-head gameplay. Now, games of Legend of the Five Rings have the opportunity to expand, as the intense conflicts between the Great Clans explode into an all-out, free-for-all battle that engulfs multiple clans at once. Fantasy Flight Games is proud to announce multiplayer rules for Legend of the Five Rings: The Card Game, now entering a beta process in which you're invited to participate! This new variant is designed to allow three or more players to participate in a game of Legend of the Five Rings: The Card Game, and even introduces a new win condition: Enlightenment. To download the beta version of these multiplayer rules, click here ( 0.1MB)! This beta will be run through our community forums, and anyone interested is encouraged to participate. Visit this Legend of the Five Rings: The Card Game subforum for discussion and updates on the Legend of the Five Rings: The Card Game multiplayer beta. Starting one week from today and continuing for the next five weeks, developers will post a weekly update in the forum as well as a survey, which players can fill out to deliver feedback on the rules. After five weeks, the finalized rules for the Legend of the Five Rings: The Card Game multiplayer variant will be uploaded to the Fantasy Flight Games website! 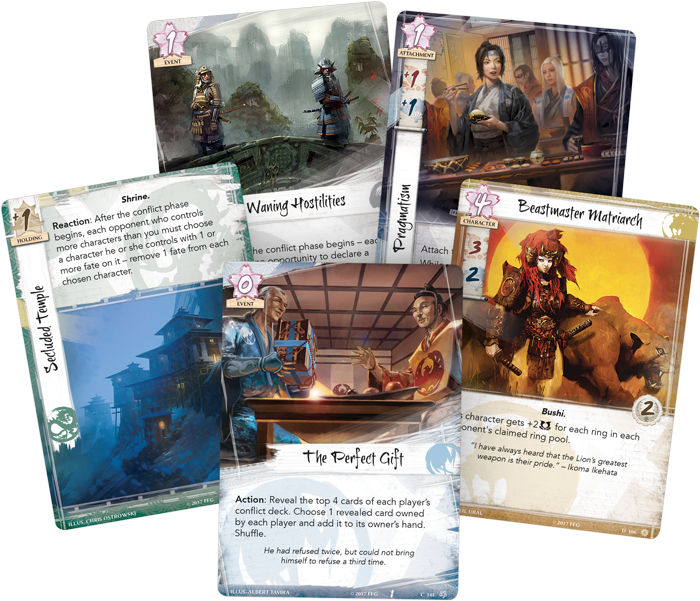 As you will soon find, the Legend of the Five Rings: The Card Game multiplayer variant plays similarly to a normal game, but now with the added victory condition of enlightenment. Instead of claiming rings as normal, rings are placed on your provinces. To reach enlightenment, you just need to collect all five elemental rings to ascend past your peers and lead your clan to victory! You can play multiplayer Legend of the Five Rings: The Card Game with as few as three players, but it can also support as many as needed for a multiplayer showdown. Download the rules today to find out everything you need to know about the multiplayer variant for Legend of the Five Rings: The Card Game. Keep an eye on the Fantasy Flight Games website for more updates about Legend of the Five Rings: The Card Game, and join us tomorrow at noon Central Time on Reddit for an AMA with designers Brad Andres and Tyler Parrott. Also, look for a special Legend of the Five Rings: The Card Game livestream on May 30th on Twitch, with more details to follow. Rise above your peers and participate in the Legend of the Five Rings: The Card Game multiplayer beta on our community forum today!